Hello and welcome to my Fanatec Clubsport Wheelbase V2.5 Review. If you are a first-time reader welcome and I hope you enjoy the website. I have been involved in sim racing for over 30 years and have played racing games from the Commodore 64 days right through to modern day titles (yes I am old). Without further ado, let’s get on with the review. 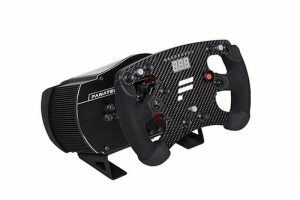 The Fanatec Clubsport wheelbase V2.5 is Fanatec’s premium nondirect drive wheelbase at this time. The wheelbase is compatible with all of the add on wheels that Fanatec have produced. 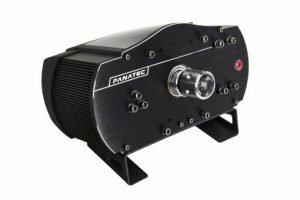 The Fanatec Clubsport is one of the smoothest belt driven wheels available and this can be put down to the tightened belts, new and improved servo motor and new ball bearings. Good: Very smooth and precise, compatible with all Fanatec Wheel Rims. Overall Take: One of the best nondirect drive wheelbases available, not sure if it is a big enough of an upgrade from previous generations. The Fanatec Clubsport Wheelbase V2.5 is one of the strongest and smoothest nondirect drive wheels going around. There is a large selection of wheel rims available to cater for open wheeler and road racers alike. The wheel’s mounting holes are in similar locations to previous Fanatec wheels and shouldn’t pose a problem being mounted in your sim cockpit. If you would like more information you can visit the Fanatec website. Hope you enjoyed the review. See you out on the track! !